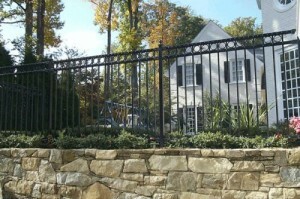 Both steel and aluminum fences will look good and last a long time with proper care. When it comes to ornamental aluminum fences and ornamental steel fences, there is, understandably, some room for confusion between the two. Both are sturdy metals that can look and feel pretty similar to the untrained eye. Luckily, experts at Hercules Fence of Newport News, Virginia are not only able to tell the difference, but can also provide some clarification as to the benefits and drawbacks of each, and hopefully give some insight into which is best for your residential or commercial needs. FACT: It’s a common belief that steel fences are stronger and more durable than aluminum fences. While it is true that steel fences are quite strong, the idea that aluminum fences aren’t is just plain false. Modern manufacturing processes have begun to include high-strength aluminum alloys that are just as strong as steel. FACT: The reality here is that both aluminum fences and steel fences are incredibly durable. Actually, steel fences are more prone to rusting, nicks, and scratches over time. Another drawback of steel in this area is that steel is less receptive of painting, and repainting will be required more frequently. However, with proper care, both alloys will make for long lasting and good looking fences. FACT: Most steel fences today are assembled from cast iron. There’s additional labor that must go into welding and powder coating each panel, which creates additional cost. While aluminum fences end up with a higher panel cost in the long run, the maintenance mentioned above works out to make aluminum cost less overall. This entry was posted on Friday, January 8th, 2016 at 3:58 pm. Both comments and pings are currently closed.